Have you ever wondered why your husband can't let go of the remote control or why he fails to notice the dirty laundry pile? According to a new book, it's the way his brain is wired. In "What Could He Be Thinking?" 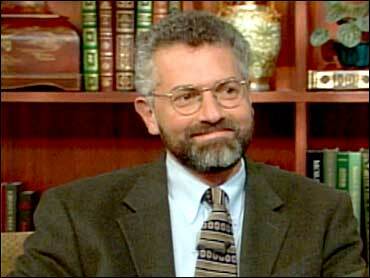 Michael Gurian used 20 years of neurological research to show that nature makes men significantly different from women. Gurian tells The Early Show co-anchor Rene Syler it has to do with the way women and men are wired. He explains, "These brain differences, we can see them on CAT scans and MRIs. They happen before five months in the womb because of the way hormones affect the brain. One of them is the difference in memory. The male tends more towards lists, trivia and those kinds of things, but the female memory tends toward sensory and emotional stuff. So you're going to remember colors of things and the way the tablecloth looked and so on and he's going to tend to remember lists -whatever is the task or list he's into." Asked if environment plays a role, Gurian says, "There are really actually three really big markers of who we are and one is our personality, that we've heard about, the other is the gender of the brain that happens in the womb and the third is upbringing. So all of them play a part. "The stuff in 'What Could He Be Thinking?' Now, that stuff is all about what happened in the womb and how our brains get wired. If a child isn't wired for a lot of talking about feelings, we can talk to that child about his feelings all the way till he's 18, but at 30, he's still not going to be talking a lot about his feelings. Those are not going to change a lot, although it's good to be doing that." Gurian is a bestselling author, therapist, and social philosopher. His books, "The Wonder of Boys" and "The Wonder of Girls" provided new insights into parenting. He says "What Could He Be Thinking?" presents a new vision of the male psyche that may allow women to understand men. CLICK HERE to take the male brain questionnaire. Men can be quite confusing — following the rules in some ways, breaking them in others; giving up their lives to save their country, but paying little attention to their own families; searching for self-worth in the long term accomplishment of goals, but giving up self-worth that they could gain by being more empathic every day. What puzzles men are! Yet given what we've learned about the nature of a man, there is one thing about men that is not puzzling: Almost every man you know is on a quest. This quest the outward manifestation of his mental and emotional interaction with his external environment brings together elements of calling, work, family, identity, emotional life (to be covered in greater detail in the next chapter), and moral character. How he makes his quest is the man's ultimate marker of self worth in the world. Have you noticed how boys already prepare for their quest from early on in life: testing themselves and each other; looking for new ways of being and thinking, inventing, building, climbing into the world? Have you noticed that human societies all share one primary way of framing and nurturing male development: through the encouragement of the hero's journey? Much of the history of male literature involves heroic quest. Even the video games that companies produce for boys to play are nearly all heroic quests. Not surprisingly, during the time between puberty and middle age, when testosterone is high, males experiment with heroism, trying on many different masks and costumes of the quest. Always the boy, as he joins the world of men, is looking to fulfill the duties and dreams of his quest for something ever greater. Boys are more likely than girls to pursue life as a heroic quest. Throughout life, men are more likely to test themselves constantly on the quest, seek status and worth in hierarchies and competition. Entrepreneurs of business motivation sell the logic, love, and language of the heroic quest in our competitive business world. "You can be anything you want to be!" "You can make a million dollars by the time you're thirty!" "You hold the keys to your own kingdom use them!" When men begin to move through male menopause which is biologically caused by the drop of testosterone in the brain and bloodstream — they become gradually less interested in constantly testing themselves. But until late middle age (and for some men, not even then), the experience of the heroic quest is central to the male journey. Women want to be heroes, certainly. They are on a quest as well. But even they seem to want men to be heroes. Studies all over the world indicate that women between puberty and middle age select, for romantic relationships and marriage, the men who are on a quest toward achievement and status. Women want men who aspire to be kings, (even if only at a local level), warriors (protectors who make them feel safe), magicians (men who have, even if in a love of gadgets, some magical power that leads to success), lovers (men who make women part of their quest). Women don't want stereotype heroes – cardboard video-game action figures; they want loving, wise, and powerful heroes – men. As nature seems to have planned things, women's heroic expectations not only drive men but can actually add to male fragility, especially to the sense of fragility felt by men who lack physical or mental prowess. From the book, "What Could He Be Thinking?" by Michael Gurian; Copyright (c) 2003. Reprinted by arrangement with St. Martin's Press. All rights reserved.